Several times a year the Knights of St. Tarcisius gather for what we call the "Sunday Fun Day." On such a day, all Knights gather to serve Mass that morning, following up Mass with a gathering for some fun activity. These activities have been a great way for our members to interact and grow together outside of serving and our monthly formation meetings. Although some of these Fun Days are funded by donation, there may be a small additional fee from our members in order to cover the costs of the event. The Knights of St. Tarcisius was founded in 2015 in order to to help young Catholic men in high school stay active in their faith, grow in holy fraternity, deepen their spirituality and religious education, play an important role in their parishes, and foster an openness to vocation. ​Please contact Deacon Steve Nguyen for more information: snguyen@archkck.org. After six months as Squires, each Squire will receive his own cassock and surplice to wear while serving at Mass. If the Squire outgrows his cassock, he will freely exchange it for a larger cassock. Squires are expected to take excellent care of their cassocks and surplices. As our young men prepare to enter their second year in the Knights of St. Tarcisius, they participate in their next ceremony: Initiation into the Order of the Knight&apos;s Apprentice. During this ceremony the Squires pledge themselves to continued service at the Altar and begin taking on the spiritual tools of the Knight in training and preparation for full Knighthood the following year. Men seeking the honor of becoming Knights in the middle ages practiced the custom of keeping an all-night vigil in preparation for their Knighthood the following morning. The Knights of St. Tarcisius keeps this tradition by having our young men participate in an all-night Knighthood Vigil Retreat. Our first retreat took place on April 21-22, 2017 and we are extremely proud of our very first full Knights of St. Tarcisius! 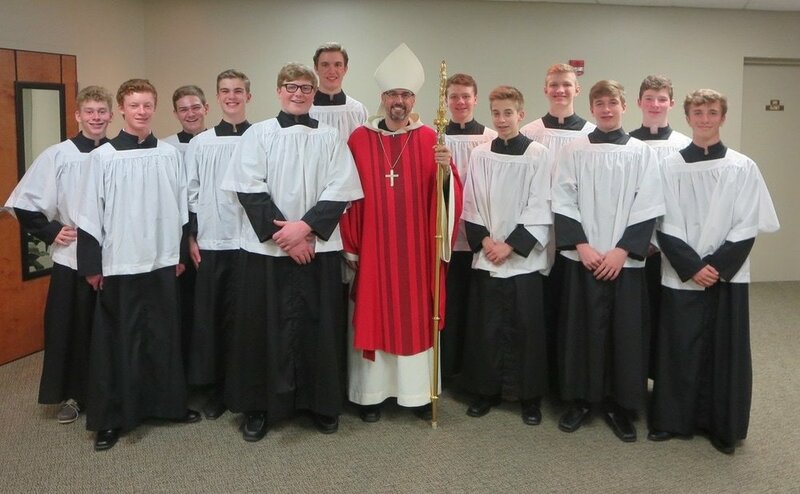 These young men are now not only equipped to serve at Masses and Benedictions, but they are now fully trained Extraordinary Ministers of Holy Communion and - like our patron, St. Tarcisius, equipped to bring the Eucharist to those unable to come to Mass. Each August 15 - the feast of St. Tarcisius and the Assumption of Mary - the Knights gather to honor our patron and Queen Mother as the young men beginning their fourth year in the Knights of St. Tarcisius take their final oath and become Grand Knights in the Knights of St. Tarcisius. This marks a culmination in their membership and looks ahead to living out a Catholic life as young men after high school.